Weave your way through the magical Western Australia with a luxury tour exploring Rottnest Island, the vineyards of Margaret River & beautiful Perth. From sparkling coastlines to towering old-growth forests, world-class wineries to once-in-a-lifetime wildlife experiences, these unforgettable 12 days will open up the Western Australia of your imagination. A favourite landscape of one of Australia’s finest writers, Tim Winton, who has immortalised it many times, this journey offers you a chance to write your own story of the south-western region of Australia. ‘Surf’ Wave Rock, travel through the great wheat belt, meet the characters that inhabit iconic Kalgoorlie and marvel at Australia’s largest outdoor gallery at Lake Ballard. Walk among the giants of the ancient Karri and Jarrah forests, and travel through the vineyards of Margaret River. Stand at the most south-westerly tip of this vast continent at Cape Naturaliste, with nothing but the Southern Ocean between you and Antarctica, and explore the beauty on offer on Rottnest Island before returning to beautiful Perth. Welcome to Perth, the gateway to Western Australia with its pristine beaches, vibrant parks and spectacular natural beauty. Meet your Tour Director and fellow travellers over a welcome dinner and enjoy an overnight Special Stay. With your local guide enjoy a walk through lovely Kings Park and the Botanic Gardens and learn about the array of wildflowers found throughout Western Australia. Visit York, one of Australia’s most historic towns. Your stay tonight is in Hyden. See the unusual rock formations of Wave Rock resembling a 15 metre wave frozen in time, formed over three million years ago. Today’s journey takes you through the wheat belt before arriving at Kalgoorlie, an active mining town with its grand old buildings, lively pubs and colourful characters. Enjoy a two night stay in Kalgoorlie. Visit Australia’s largest outdoor gallery at Lake Ballard. With your local guide, hear all about artist Antony Gormley’s Inside Australia installation. Tour Australia’s largest gold producing mine, the Super Pit then explore the wide streets and former ghost town of Coolgardie. Stop to see the impressive salt lake, Lake Lefroy before continuing through Norseman to Esperance where you'll enjoy an overnight stay. See the remarkable Pink Lake, which in the right weather conditions turns a soft shade of pink. Visit the beautiful Stirling National Park, a botanic reserve and the mighty Bluff Knoll. Arrive in Albany, your home for the next two nights. Explore the old whaler’s station as part of your visit to Discovery Bay and Whale World. Visit the moving National ANZAC Museum, built to commemorate the 100th anniversary of the Gallipoli landings. Assume the identity of an ANZAC-related character and follow their personal experience of the Great War. The Valley of the Giants Tree Top Walk provides you with a bird’s eye view of the towering forest. Ride on the Pemberton Tramway through beautiful Karri and Jarrah forests and stand in awe at the foot of the famous Gloucester Tree, standing at 61 metres. Travel through the vineyards of Margaret River before arriving at your hotel for your two night Special Stay. Marvel at the crystalline formations of Mammoth Cave as part of your guided tour before a visit to Cape Naturaliste Lighthouse. Climb to the top for panoramic views of the Indian Ocean, Cape Naturaliste, Leeuwin-Naturaliste National Park and the beautiful Geographe Bay coastline. Sample the wonderful wines that have made Margaret River famous, followed by a delicious gourmet lunch. Walk along the famous Busselton Jetty before heading north to Fremantle for an overnight stay. Enjoy your guided tour on board the local tram with a visit to the historic prison. Enjoy the morning at leisure in Fremantle before discovering the delights of the Swan River on your cruise from Fremantle to Perth. Later visit the Bell Tower, home to the Swan Bells that originally came from Saint Martin in the Field’s Church in London. Enjoy your two night stay in Perth. Journey to Rottnest Island for a chance to spot a quokka or partake in a food and wine trail through the Swan Valley. 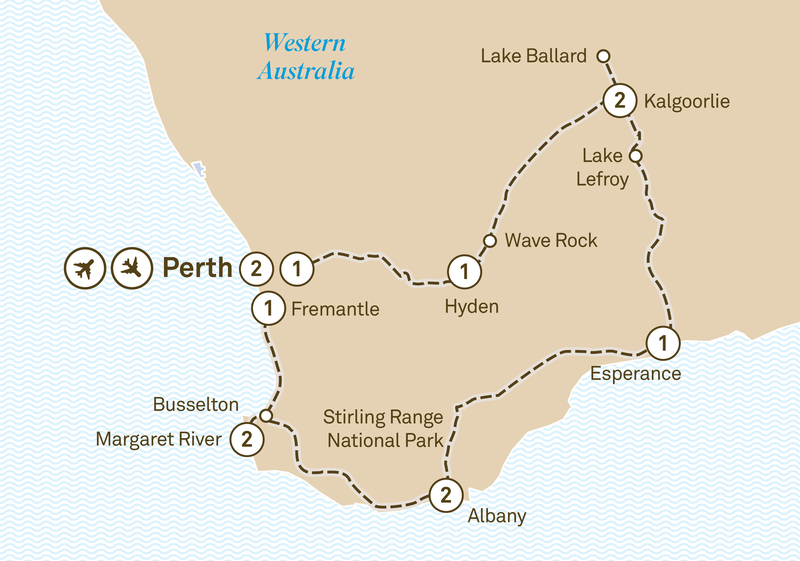 Alternatively, take a walking tour of Perth or enjoy an Upper Swan Valley lunch cruise. You could also opt to visit Nambung National Park and explore the Pinnacles. After breakfast bid farewell to your new friends before returning home.